Good Samaritan: "It looked like she had a beard"
RANCHO BERNARDO, Calif. (KGTV) -- "It looked like a cartoon." 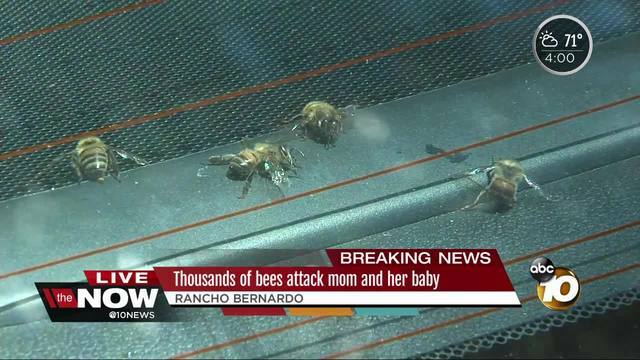 That's how one man described what he saw when he responded to screams for help from a mom who had been attacked by thousands of bees while walking with her baby and dog on a Rancho Bernardo street Tuesday afternoon. "It looked like she had a beard," Todd Lackner said. But they were bees. Thousands of them covering her neck. She had bee stings on her eyes, arms and face. The woman tried to swat away the bees away as she writhed on the sidewalk of Poblado Road. "She swatted them away from her face and they came back," Lackner said. The Good Samaritan had been sitting in his living room working on the computer when he heard repeated screams of "help!" Lackner went to his backyard where he saw the victim laying on the ground paralyzed in shock, he said. He drove down the hill to find the woman with her baby boy sitting in a stroller nearby and a dog all swarmed by bees from a nearby house. Lackner said the mom got the worst of it. He took the baby and put the dog in his car to try to get it away from the bees but they followed it inside. The vicious bee attack was traced to a hive at a nearby home. A pest control company removed it immediately. The homeowner told 10News she knew about the hive but didn't want to remove it herself. She was going to call professionals but just hadn't gotten around to it. She also said she heard the woman screaming and fire trucks but thought it was a car crash. She didn’t find out until later it was a bee attack. The baby is okay but his mom was taken by ambulance to Palomar Medical Center. Her condition is unknown. 10News spoke with Evan Walker, a personal injury attorney. He says, depending on the circumstances, the property owner could be held liable.